WE HAVE RECENTLY RELOCATED TO COLONIA DEL SACRAMENTO URUGUAY AND ORDERS FOR ARGENTINA CAN BE ARRANGED THE FIRST WEEK OF EACH MONTH FROM MAY 2017. Your biltong can be prepared medium rare (pink and moist) or well done (dark and dry). It can be with a thin strip of fat or totally lean and either plain ( normal spicing) or spicy hot (chilli pepper). Due to the humidity in Buenos Aires, we now only offer it whole in convenient strips (as per the pic above); the strips should be kept in the refrigerator for up to 1 week or can be frozen in a zip lock freezer bag indefinitely; defrosting is very quick, a few hours on a plate on your table will suffice; cut to preferred size slices/chunks using a sharp steak knife. Just sprinkle a few tablespoons over your salads, eggs, into mashed potatoes on sandwiches or any food of your choice and get the sensational Biltong flavour. Those previously boring foods now get a new infusion of flavour!! Pricing is as per biltong , minimum order 200g. Only the best quality Uruguayan beef is used. Your enjoyment is paramount to us. All our biltong is guaranteed to please or your money back. I thank you enough for bring BILTONG to Argentina. The product is great and top-notch meat makes it even better. I suggest that everyone atleast try this soon to be sensation!! I am really excited about it too; the way the Argentine meat takes on the spices is a whole new revelation for me. And... I want more! Let me know when and where I can buy some. I gotta try this!! I was raised up north, no electricity, only dried beef. Love it. Biltong has been called Cowboy Beef too ; not only horsemen love it, be sure not to leave home without a packet of this delicious snack whether you're watching a polo match, horse racing, show jumping or freedom riding on the pampas. 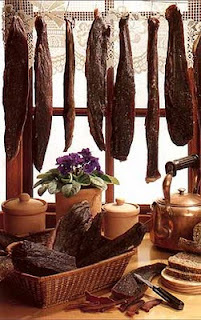 SAARG's Biltong in South Africa is served at parties with wine, champagne and goes great with beer too. I believe it has found a new home ! !